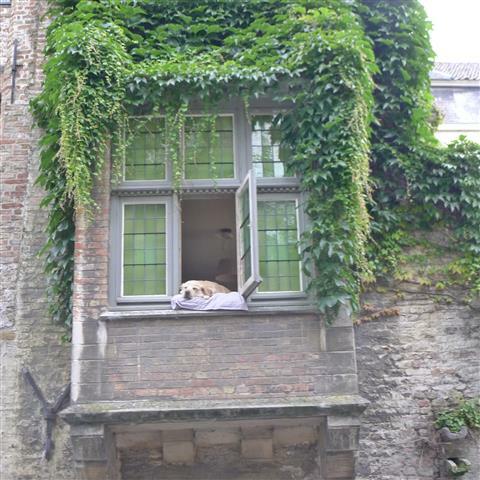 We Meet Fidel, Bruges Most Famous Resident … But He Barely Gives Us A Glance. 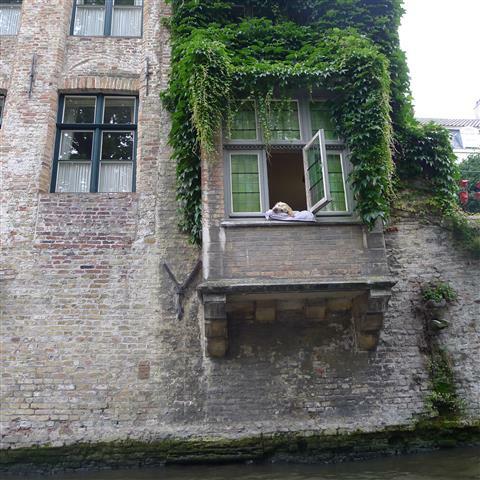 Following yesterdays post, my Singaporean friend “Velveteen” and I are sitting on a tourist tour boat as it makes it’s leisurely way around a few of the canals in Bruges, Belgium. Because I’m using crutches and it was easier to sit at the very front of the boat, we get talking to our guide, asking him about various buildings and the history of the city. 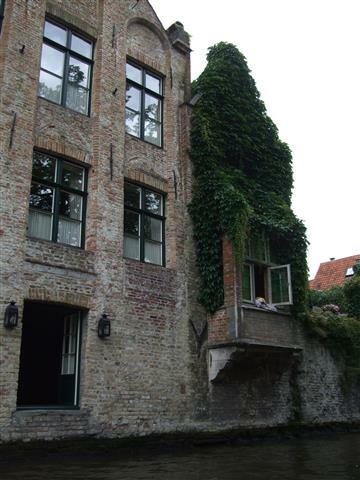 All of a sudden he points out an open window in one of the houses alongside the canal and tell us to try and get a good picture as we get near. As we approach he tells everyone on the boat a little story about one of Bruge’s most famous inhabitants, a Labrador dog called “Fidel”. 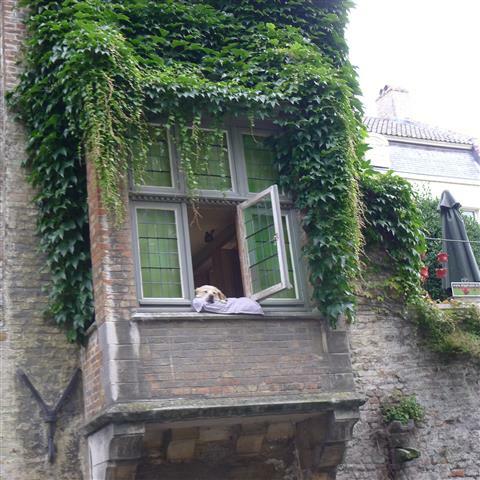 The house is more accurately a Bed and Breakfast hotel called “Côté Canal” and Fidel has become famous due to his habit of almost literally hanging out in the window over the canal. Our guide tells us that he can be seen almost daily, either sleeping on his large pillow or watching the tourists cruise by his square bay window, and that he’s such a frequent sight that he’s become somewhat of a tourist attraction in his own right. Since everyone in our boat also took photos of him, we also helped perpetuate his fame as probably the single most photographed resident of Bruges. Fidel didn’t give us too much of a glance, after all we were just another boat-load of admiring paparazzi taking his photograph, and when a little while later we passed by him on the return journey, he hadn’t even bothered to move a muscle either. Our guide tells us that Fidel is such a hot item in the city he even had a cameo role in a 2008 movie made in the city called “In Bruges”. … And no, in the movie he’s not doing any tricks, doggie stunts or busy saving the day: He’s making an appearance as “himself” … and just as everyone will recognise him: lazy and sleeping in the open window of his bay window.